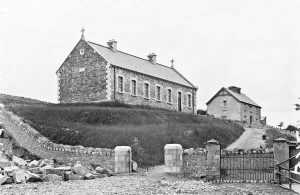 In 1894 two Presentation Christian brothers arrived in Letterkenny from Cork to open a primary school for Catholic boys. They were invited by the Most Rev. Dr. Patrick O’Donnell, Bishop of Raphoe. They lived in a teacher’s house beside the school which is the present day Pastoral Centre. The school beside the house was called St.Eunan’s Monastery School and it’s still there today situated on the southern slope of what was known then as Sunny Hill. It consisted of a large room in the middle with a smaller end room at either end. It was officially opened on the 30th of November 1896 by Dr.O’Donnell. 70 pupils attended. The old house was considered an unsuitable residence for the Brothers and a new monastery was built on the same site. It was blessed and opened by Cardinal Logue (former Bishop of Raphoe) on June 28th,1911. The Brothers lived there until 1983. 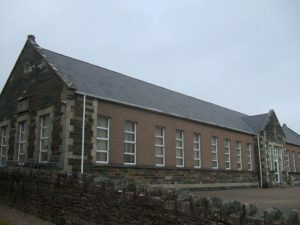 The number of pupils in the monastery school increased and it was necessary to accommodate some classes in the local Trinity Hall in 1952. Sometime after that they moved to Wolfe Tone Hall which was located behind Hegarty’s Hotel at the Market Square. Then on the first week of February, 1956, the boys were transferred to St.Columba’s School-the building we now know as the “Old School”. This would have been the girls’primary school before they moved into their new building, Scoil Mhuire Gan Smál in 1956. The boys’ school was renamed Scoil Cholmcille. The monastery school became the headquarters of a boy’s club. By 1973, there were 373 boys on the roll with five Christian Brothers and nine lay teachers on the staff. In 1974, work began on a new building on the Convent Road. The new school was able to enrol all the infant boys who had up until now attended Scoil Mhuire Gan Smál for Junior and Senior Infants. 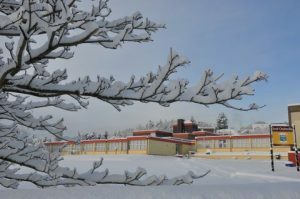 As the population grew, it was found necessary to build an extension which began in May 1976 and by September 1977, it was finally possible to house all sixteen classes under one roof. By 1981 the number on the school roll was almost 700 pupils and 23 teachers. This period also saw departure of the Presentation Brothers from the school as a result of a serious fall in the number of vocations for the Presentation Brothers. In April 1983, it was left to Principal Brother Raphael O Halloran to inform the 22 members of staff of the decision of the Presentation Brothers to leave Letterkenny. The last religious principal handed over to the first lay Principal, Mr. Tom Redden, in September, 1983. He retired in 2007 and Mr. Paraig Cannon was appointed Principal.